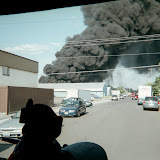 On Sunday, July 1, 2012 at 7:33 AM, 6 Companies of Spokane Firefighters, 1 Senior Ladder, 1 Pumper-Ladder, 1 Heavy Rescue, 3 Engines under the direction of Battalion Chiefs Haworth and Moline, responded to a Structure Fire at 810 East Cascade Place in Northeast Spokane. Spokane Firefighters from the neighborhood Fire Station (Station 18) arrived within 4-minutes to find heavy smoke showing from the second floor of a single family residence. The incident was upgraded to a "working fire" nearly immediately which added an additional Ladder Company and AMR Ambulance to the incident. Finding two occupants and one dog that had successfully escaped, firefighters immediately began to attack the fire. Ladder Companies began by laddering the roof to ventilate the fire while engine companies fought the fire from the home's interior. The well coordinated effort of firefighters confined flames to the home's second floor and extinguished the fire in just 1 hour. One female resident was treated by FD Paramedics and transported for smoke inhalation complications. There were no additional injuries reported from either residents or firefighters. The second floor and ceiling sustained significant damage which eliminates continued occupancy by the family. There was not a working smoke detector in the home and this family was incredibly fortunate to survive this experience. The SFD recommends that everyone check their smoke detectors monthly and replace the batteries twice every year. Please, do not take the chance-be proactive and give your family every chance for survival from residential fires.